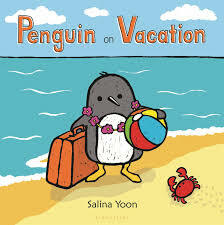 Our Cover to Cover Book of the Month for January is Penguin on Vacation by Salina Yoon. Beaches and friendship! What could be a more ideal scenario for Penguin and his wondrous vacation! Penguin is tired of doing the same winter activities and decides that it’s time for a vacation! His vacation destination is very different than home, leaving Penguin questioning how to pass the time. Penguin on Vacation by Salina Yoon provides a wonderful opportunity to talk about the importance of friendship and what a wonderful difference friends can make in improving situations. While reading, talk to your child about friendships that are important to you. Invite your child to reflect on their own experiences with friends. Being open to all input provides a wonderful opportunity to discuss ways to be a good friend to others. Penguin rowed his raft all the way to the beach! Sing and dance to the song Row, Row, Row You’re Boat and invite your child to imagine rowing off to a faraway land. Find the song here: https://youtu.be/mPZA6-oUXIU. Alphabet knowledge is an important early literacy skill. Simple concepts, such as same and different, help children recognize letters. While reading, bring attention to the similarities and differences found in the illustrations: “Penguin and Crab have the same eyes, but Crab has eight legs and Penguin has two.” Noticing these subtleties will help your child to begin to notice the subtle differences and similarities found in letters! Balls are so awesome that Penguin has his with him on almost every page! Playing ball with your child not only improves motor skills, but it also promotes literacy! The hand-eye coordination needed to track the ball is a skill necessary for reading and writing! Send a picture of you and your child playing ball!